But even in this basic three-step process, many people forget to account for the crucial final step, which is investing your savings. 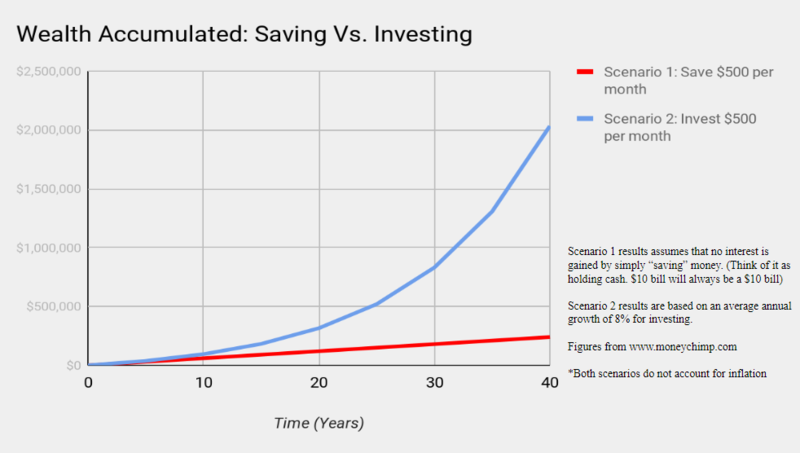 If you were to only put your money in a savings account at a bank, over the long term, you’d almost be losing purchasing power due to inflation (set around 2-3% annually in America). Unless your savings account is providing interest rates of 2-3%, you will be losing wealth for every year you allow your savings to be locked up in a bank. In the best scenario, your bank’s interest rate would just match inflation. 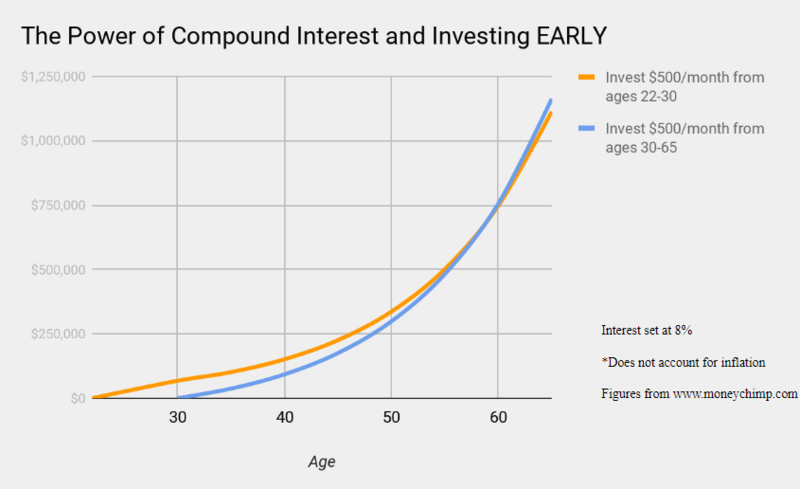 The reason investing is powerful is because of compound interest. For the past ~80 years, the stock market has averaged an annual return of roughly 10%, without accounting for inflation. This figure varies depending on who you ask, so let’s be conservative and use just 8%. If you start investing at the age of 22 and manage to put in just $500 into the stock market every month for the next 8 years and simply just STOP, you will retire with over $1.1 million dollars (assuming you retire at 65). Now $500 a month is quite manageable, and in this scenario, you only have to save and invest your money from the ages 22-30, and you are set to retire with over a million dollars. Your total investments (the actual money you contribute) totals $48,000. Now let’s say you start putting aside money at the age of 30 instead of 22. In this scenario, you’ll have to save $500 every month for the next 35 YEARS to retire with roughly the same amount of money. The total principal would be $210,000. So the question is, what are you waiting for? Even just $100 a month. Or $100 a year. It really doesn’t matter. What matters is you don’t forget step three in the process of generating wealth. If you want to live a happy life in the future, you need to practice a little frugality while you are young. Investing for the future is the name of the game here. Even if you want to invest in stocks, how do you know which stock to buy? Apple? Amazon? What about these new marijuana stocks that keep popping up? Next Post: How much did your lunch cost?